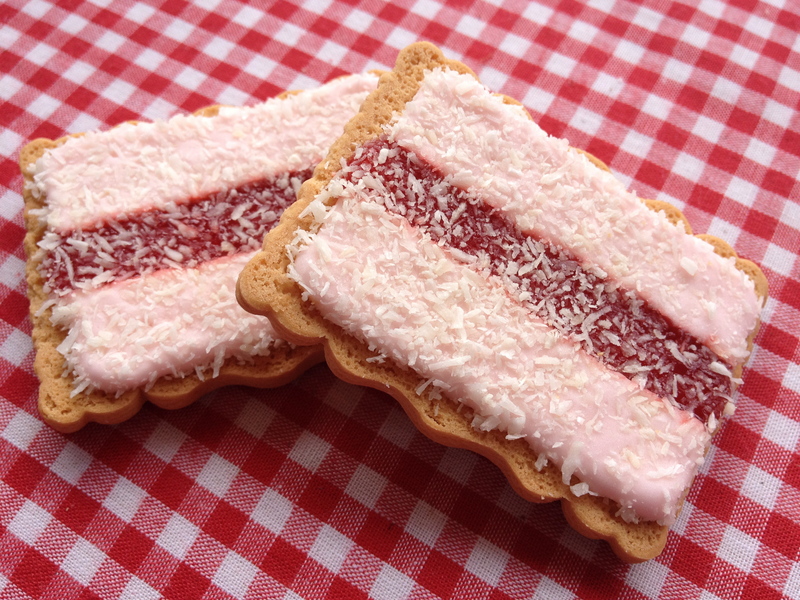 One of my favourite biscuits is the Iced VoVo (below). 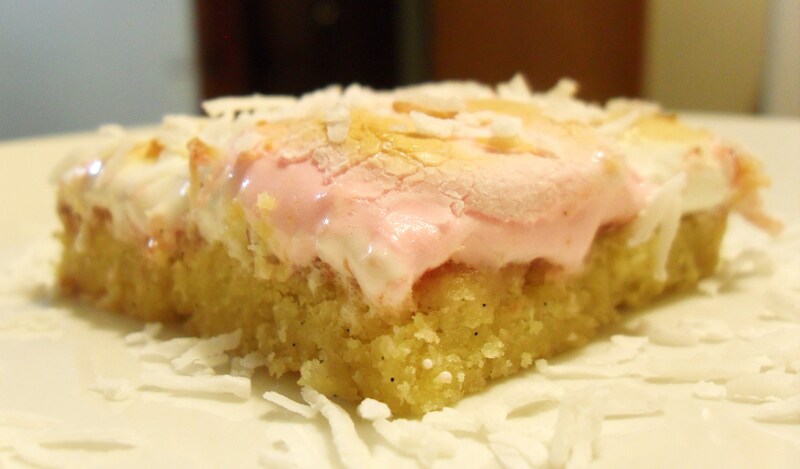 They have a biscuit base, two lines of marshmallow and a line of jam with a light layer of coconut on top. While watching Masterchef a couple of years ago I learnt that these biscuits are Australian, and not sold elsewhere, which means that sadly the rest of the world does not get to enjoy this delicious biscuit. Until now! So this is pretty much a giant Iced VoVo, a delicious vanilla crumbly biscuit base, a layer of jam, topped with toasted marshmallow and coconut. Seriously tasty, and pretty easy to make. Enjoy! Place rack in the center of the oven and preheat oven to 180C. Line an 8-inch square pan with baking paper (leaving some overhanging paper flaps on two ends). Set aside. In the bowl of an electric mixer, fitted with a paddle attachment, beat together butter and sugar until pale and fluffy, about 3 minutes. Stop the mixer, scrape down the sides of the bowl, then beat in vanilla bean scrapings (or vanilla extract) and egg yolk. Beat until well incorporated. Stop the mixer and add flour. Beat on low speed until completely incorporated, (you may need to pat it together with your hands). Spoon batter into prepared pan. Sprinkle with flour. With clean fingers, press the dough into the bottom of the pan. Use a bit more flour as necessary so that the dough doesn’t stick to your fingers. Try to make the crust as even as possible. Bake crust for 20-24 minutes until golden brown around the edges, but still slightly soft in the center. Remove from the oven and allow to cool for 20 minutes. Run a thin butter knife around edges of the pan. Use the two parchment paper flaps to carefully remove the crust from the pan. Run a butter knife between the crust and the paper and carefully slide the crust from the paper and onto a unlined baking sheet. Top crust with a thin layer of raspberry or strawberry jam. Arrange marshmallows on top of jam. Return to the 180C oven for about 4 minutes. This will warm and soften the marshmallows. Remove from the oven and turn the grill onto high. Use the back of a spoon to gently press and smash the top of each marshmallow. Once all the marshmallows are smashed, place in the grill. Keep a very very very very close eye on the marshmallows. They’ll toast in seconds. They’ll burn in seconds. Remove toasted marshmallow cookie from the oven. Allow to rest for 10 minutes before slicing. Cookies can be served slightly warm or at room temperature. Cookies can be left, well wrapped at room temperature, for up to 4 days.